I'll bet things are hopping over at the Four Thirds Photo and My 4/3rds forums, not to mention the LUG. No sooner had I written about Two Exciting New Lenses—and wondered aloud where Leica was at PMA—than a third new lens comes along that trumps the other two for excitement, and by a pretty fair margin, too. Leica AG of Solms, Germany has introduced its first "independent" (cross-platform) lens since ye misty days of LTM (39mm Leica thead mount, also called screwmount). It's a 4/3rds-standard zoom that will fit and work on Olympus digital SLRs and on Leica partner Panasonic's spanking new high-tech DSLR, the Lumix DLC-L1 (which is itself the first 4/3rds camera not made by Olympus). People who are not Oly aficionados should note that the focal-length specification of Leica's new lens doesn't mean it's wider than the 17–50mm and 17–55mm ranges of the Tamron and Canon lenses I wrote about, but longer. The format conversion factor ("crop factor") for the 4/3rds system is 2X, so the D Vario-Elmarit would be equivalent to a 28–100mm in 35mm terms, vs. closer to 28–80mm for the Canon and Tamron. The Leica lens is a tad slower at the tele end, but that can be put down to its longer reach. Best icing on this cake? The lens incorporates Panasonic's excellent image stabilization technology. Cool though this one lens is, the implications of this are what are probably rocking a few peoples' worlds right now: looks like Leica's gonna be building 4/3rds lenses in the 21st century. Woo-hoo! UPDATE: Rumor has it that there will be a version in R-mount as well. Mike, did you forget to mention the manual aperture ring? Together with it's convential shutter speed dial, the new Panasonic can be used like a Proper Camera. 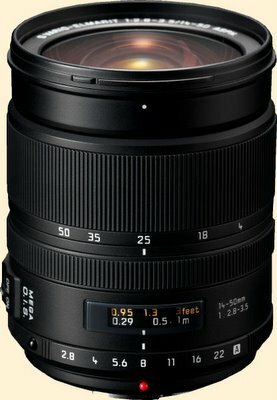 I know this sounds like a foolish question, but is the lens autofocus? I see that the Panasonic body supports autofocus, but I didn't know that Leica made autofocus lenses. 4/3 standard lenses have quite a bit of communication between the camera (which is apparently close to an Olympus E-330 in its capabilities) and the lens. They are AF with focus-by-wire override, or MF,also focus-by-wire. Since there is image stabilization in the lens and that requires still other sorts of electronic communication between lens and body, I think you can take AF for granted. Now what I would like to know is how AE works with the manual aperture ring. Is aperture-dominant the default setting? I am also interested in the Olympus 330. I love changing viewpoint with a tiltable LCD screen. I am only frustrated, me loving compact gear, that 3/4 system cameras/lenses are as big as 35mm cameras/lenses, despite the format which is 1/4 the area. And this goes for most other gear which has a decent-sized sensor. Just too darn big. It seems part of it is the light-entry-angle problem with digital capture. They really need to solve that. Another thing that I wonder about on this new lens is what is the filter size?